Whether you are new to the trade show circuit or have been attending industry conferences for years; whether you cater to consumers or market directly to business; whether you have a huge budget or are just getting started; Rhode Island movers at Conlon Moving & Storage can help get you and your expo booth to your destination. Trade show moving services in Massachusetts and Rhode Island can be complicated, especially if you require long-distance or international move management. Depending on the industry that you are in, you may require logistical assistance beyond New England and the eastern seaboard. If that sounds like you and your current or future goals, then keep reading – we’ve got some tips to share that will help you prepare to literally take your show on the road! Sounds simple, right? Just buy a booth space at the next big industry conference and start selling your stuff. Unfortunately, there’s much more to it than that. Beyond a church rummage sale or neighborhood garage sale, trade shows can be complicated – even the moving in and out of your stuff from the convention hall can be a lesson in logistics. If you want to be successful and truly market your products, services or business at the next big trade show, here are some things that you need to know. 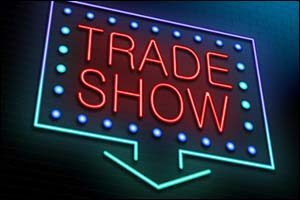 Dealing With Trade Shows is a Tricky Business – Each trade show that you will work with is different. Even if you follow a series of trade shows from one major city to the next or even halfway around the world, you cannot expect to have the same experience from one show to the next. Approach each show as a unique experience: ask questions, read the fine print, pay attention to the guidelines, and everything will be OK.
ears our commercial clients have approached us about domestic and international move management and strategies for expositions and trade shows. Getting your expo booth, furniture, marketing materials and other assets from one show to the next on-time, being able to track its movements, and assuring that everything will be unloaded in time for set-up at the next location requires a lot of knowledge, equipment, and teamwork. Through our alliance with United Van Lines in the United States and UniGroup Worldwide UTS on a global scale, our Rhode Island movers can help you make plans to get your display and accessories from any point A to any point B in over 200 countries around the world. You Need to Have a Plan – Before you contact our team, you need to know what you want to bring, how you want to sell it, and how many team members will be coming along as well. Whether you are setting up a basic 10 x 10 expo booth or if you get a larger corner spot on the aisle, you and your team need to have a game plan before you ever think about trade show moving services in MA, RI. Figure out how big of a booth set up you can have with the amount of space that you will be given, including all of the furniture, products, samples, technology and team members that will also be inside the booth. Consider working with a professional booth and display builder who can design you a great showcase for your company that will stand out among a sea of competitors. Market Your Company On-Site and Market the Event Ahead of Time – Your marketing team really needs to be on its A-game when you dive into exhibiting at trade shows. You need to get solid marketing materials, including flyers, brochures, business cards, downloadable apps, scan-able QR codes – anything that you think will help connect the customer to your brand and get them excited about what you do. You also need to pre-market the event and your participation in it ahead of time. This is a great opportunity for customers, clients and colleagues to come out and meet you and your staff, so they can see your products or business model in-person at a major event – make sure they know about it and will come out to see you at the trade show. Train Your Team and Prepare them to Shine – When you rely on our team of Rhode Island movers, you won’t need to spend time worrying about whether or not our Pawtucket moving logistics and trade show moving services in MA, RI or CT will deliver as promised. You don’t even have to worry about international move management because we providing tracking services in real-time that will help you monitor the transportation of your assets. All you need to focus on is preparing your staff to man the trade show booth. Their performance is what will make or break the experience for you. Instruct them on where they are to stand, what they are to say, what products they are allowed to hand out and what specific things you want them to introduce to attendees or stay focused on throughout the event. This may change at each stop on your worldwide expo tour, but as long as you host team meetings and provide your employees with the tools they need to succeed, you will be successful. If you are interested in learning more about our trade show moving services in MA, and RI, for domestic and international move management, give us a call at 508-336-7766. Our team will be happy to go over all of the options available through Conlon Moving & Storage, provide you with useful data on what you can expect from our local Rhode Island movers, and get you on board with everything that we have to offer. Call today and start making plans with our team of Pawtucket moving logistics specialists for your industry trade show or event.